- The Lions defense is holding them in this game, but it is only adding to the frustration. The Bears aren't a very good team at this stage. They had lost five out of six games until beating the Cardinals last week. It's probably the biggest reason the Lions have been able to stick around despite their propensity to commit turnovers. - Mikel Leshourse seems to have regressed rather than made progress late in the season. It doesn't seem like he is able to get many yards on his own. 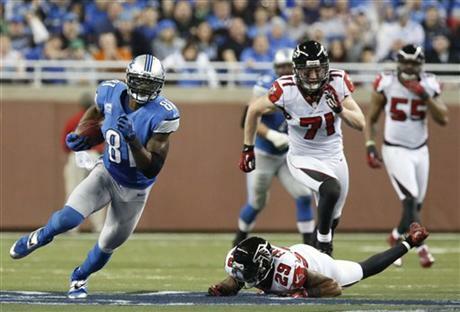 - The Lions offense is floundering again. Not a good sign. - This game, like the Lions' season, got dangerously close to being out of hand in a hurry. It's one thing to lose. It's another to get embarrassed. The Lions were on the brink of getting embarrassed until scoring just before halftime. - A bright spot: The Lions' defense held the Bears to field goals in a couple tight spots, or it would be a Chicago rout. 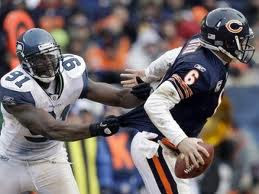 - Forget Warren Sapp. Lions' defensive tackle Ndamukong Suh, if he wants to see it, just got a lesson from Bears' defensive lineman Isreal Idonije about how to defeat a double team. He made a great play, forcing a fumble by Lions' QB Matthew Stafford, and setting up the Bears second TD of the game. - There are few penalties worse than a holding call on a screen pass. Yet, it happened to Lions' guard Stephen Peterman in the second quarter. Ouch. - An obvious weakness for Stafford is dropping the ball in place vs. zone coverage, over the middle-of-the-field, on intermediate routes,. He missed wide receiver Calvin Johnson on just such a pattern in the second quarter. Johnson was open, too. He missed him while on the run late in the quarter, too. Stafford's ball security has not been good lately, either. There is a definitely room for improvement. - Would I fire Jim Schwartz as head coach? No. But I know enough about the Lions to understand that there is only one vote that counts on such matters. It is owner William Clay Ford Sr. And I also know enough about the Lions to understand Ford Sr will do exactly what he pleases - regardless of what his son, the media or the fans think. It is real simple: If Schwartz rubbed Ford Sr. the wrong way, he will be out. Ford Sr's actions virtually have little to do with any sort of public or private pressure that is being exerted on him. I do believe Chris Mortensen's report about Schwartz's job status is credible. There is an unpredictability with Ford Sr. Sometimes he sticks with a regime or coach forever. Other times, he does have knee-jerk reactions. He does try to do what is best for the team, and plays to his own instincts, which have often been off given the Lions' on-the-field record since he has owned the team. - The Lions regained most of the yardage after the play, and did get a field goal, but defensive end Kyle Vanden Bosch should have just fallen on, instead of trying to pick up, the fumble by Bears' QB Jay Cutler. - There have been a few times in recent years I have praised Lions linebacker DeAndre Levy and safety Louis Delmas for their ability to tackle in the open field. Earl Bennett's long TD catch-and-run was not one of them. That was an awful example of open field tackling. - If the Lions lose this game, they could get as low as the third overall pick in the upcoming NFL Draft. If they win today, they could fall to 9th. But the crowd here at Ford Field clearly would like them to win the game today. A lot of Bears fans here today, though, kind of line the pre-2011 days. It's a very different atmosphere from the last time the Bears visited Ford Field, that's for sure. Beating TCU 17-16 in the Buffalo Wild Wings Bowl was an important measuring stick victory for Michigan State. The fact MSU beat Georgia last bowl season has gained cache because the Bulldogs were so good this season. TCU, loaded with freshmen and sophomore starters, and likely to get standout QB Casey Pachall back next season (he left the team after being arrested for a DUI and reportedly has been in rehab; he likely will be back in the spring and has another year of eligibilty remaining), will be strong next season. Besides, how often do Big Ten teams knock off SEC and Big 12 teams in bowl games in back-to-back years? From that standpoint, it was an impressive accomplishment. The bowl victory did not, however, mask the Spartans' bigger issues. Their receiving corps was terrible by major college standards this season. If running back Le'Veon Bell is not back (he is contemplating entering the NFL Draft) the offense could really be in trouble, although Connor Cook did show promise at QB in the bowl game and could beat out underwhelming Andrew Maxwell for the starting spot. Also, will defensive end William Gholston return? His production in 2012 was disappointing, but there is no disputing he is a rare talent would be sorely missed. Yes, Jabari Parker was a big-time receuit. It's true, Michigan State basketball coach Tom Izzo put an inordinate amount of time recruiting him. Yes, it was Duke that landed the big fish. Yep, the Spartans' 2013 recruiting class is looking like it will be a zero. But it hardly tells the story of the bigger picture, which is a future that is going to be bright for MSU's basketball program regardless. That's because their freshman class is very good. Gary Harris has already shown flashes of brilliance despite some injury issues. Denzel Valentine is better than advertised. He has the type of all-around skills and leadership qualities that could make him a Draymond Green-Mateen Cleaves type of leader eventually. It's been forgotten, because he was slowed by a back injury, just how good a player Matt Costello is. Brendan Dawson is a sophomore. He might be the best player on the team. There will be senior leadership next year in Keith Appling and Adreian Payne. Not landing Parker, leaves more opportunity to recruit in the future, and also take in a special transfer, should one become available and fit MSU's program. And there is a bottom line about Izzo that should always be remembered. He is as good a coach as there in the nation. He prepares his team as well as any coach in the country in March, when it really matters. 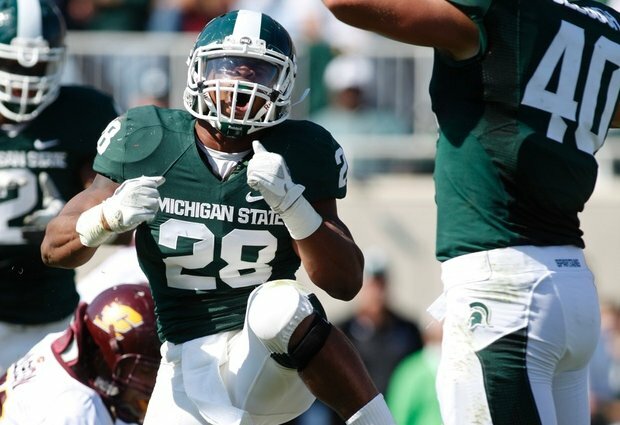 If the Spartans had landed Parker, they would been national champion contenders during his time in East Lansing. But they will be anyway. - Calvin Johnson is single-handedly keeping the Lions in this game. What an effort and performance. - Another strange aspect about the Lions' season. They have 17 rushing touchdowns, their most since 1997 when Barry Sanders rushed for more than 2,000 yards. It doesn't jive with their dismal record at all. - Roddy White and Julio Jones, the Falcons' wide receivers, are both amazingly big and fast. White has been particularly impressive tonight. The Lions secondary is holding up pretty well in the second half so far after a dismal first half. Last season, White only had 52 receiving yards against the Lions, despite the Atlanta victory. Jones missed the game with injury. - The crowd has booed the Lions' with great lust tonight, but they have been very loud with cheers during the bright spots in this game. There have been "Calvin, Calvin, Calvin" chants They sure don't appear to want the Lions to lose this game to improve their draft spot. - What? When did Calvin Johnson go to the Brandon Pettigrew school of ball security? I thought the Lions might have a fighting chance in this game, but it wasn't going to happen turning the ball over like that. Now it's turned into a drubbing. - Here's stating the obvious: Johnson has 100 yards receiving already and the Lions are getting drilled by 15 points at halftime. There is just something flatout wrong about that, but much of that has to do with Johnson's fumble. - The second Falcons' touchdown pass, a 39-yarder from Matt Ryan to Roddy White, was a beautifully designed play. It wasn''t even remotely a pick play, but it did put future Hall of Fame tight end Tony Gonzalez in ideal position to spring White loose for the score with fantastic block. In comparison, the Lions offense appears to be lacking imagination. But it is easier to be creative when your dealing with multiple talents like White, Gonzalez and Julio Jones compared to Calvin Johnson and, well, Calvin Johnson. That is what the Lions' offense is like at this point, isn't it? - Suffice to say the Lions will be looking to upgrade their kick return position next season. It's not just that Stefan Logan hasn't been breaking plays, but he has become mistake prone. Some of it is just bizarre, the collision last week on the punt at Arizona, and waving his hand and claiming he didn't make a fair catch tonight, when there appeared to be much room to run on a punt. - Back-to-back plays summed up the Lions' season: Calvin Johnson breaking loose on a 41-yard catch and run, shattering Detroit's single-season receiving yardage mark that had been held by Herman Moore in the process, and Mikel Leshoure losing a fumble on the very next play. 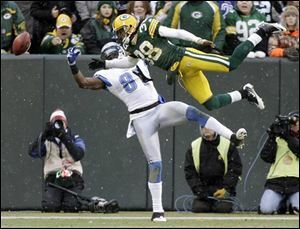 - Another tale of the Lions' 2012 season, a touchdown for field goal exchange, one not on Detroit's side. - More Joique Bell and less Leshoure would be welcomed at this point. Bell has proven to be the better player, in my opinion. - Chris Houston was beaten badly by Roddy White on the Falcons' touchdown pass, but in truth, he has been the least of the Lions' problems this season. He is a good player. 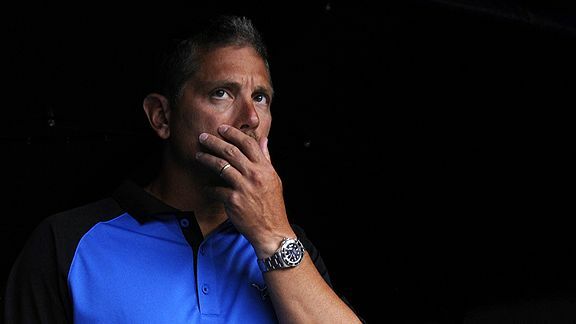 - So ESPN is reporting Lions'head coach Jim Schwartz's contract is through the 2015 season. While reporting this, they also stated Schwartz is going nowhere after this season because of his contract. I believe they are right. It's just stunning to me, really, why anybody felt compelled to make the length of Schwartz's contract a secret. That's one thing Lions' fans have a right know if they are expected to invest emotionally in the team. - Lions' quarterback Matthew Stafford has completed passes to Calvin Johnson of 41 yards and 18 yards on which he threw the ball sidearmed. - The Lions are using fullback Shaun Chapas as a lead blocker a lot in this game. It is not working well, though. - The Lions are going to rack up a bunch of numbers in this game, win or lose. It will be completely meaningless should they lose this game. They had this game early. Had they gotten any sort of lead on the Cardinals, there was no way their going to come back given their quarterback situation. It's why I have mixed feelings about the importance of Calvin Johnson's record for receiving yardage. Yeah, on one hand, it would be a big deal to pass an all-time great like Jerry Rice. On the other, when did Rice play on a team this bad? Ditto for Matthew Stafford. Sure, he is an extraordinary talent, but where is the consistency? - For a 40-something kicker, Jason Hanson still has remarkable leg strength. He drilled that field goal in the third quarter. - Awful call by the officials on Lions' cornerback Chris Houston. That was nothing more than good coverage on one of the top receivers in the game, Cardinals wide receiver Larry Fitzgerald. It was a completely different standard than had been set earlier in the game when Patrick Peterson was defending Johnson. - It was too risky a throw by Lions' QB Matthew Stafford out of the end zone, sure, but, still, Cardinals' cornerback Patrick Peterson should have been flagged for holding on Calvin Johnson. It was a brutal non-call. No two ways about it. There was no excuse for the second interception, though. Just a poor read by Stafford, who had a poor first half. - Just when it looked like the Lions were taking control of this game, there was a muffed punt and momentum was gone. It's been a familiar tale all year. It's always something. Too often that something has been blunders on special teams. It's pretty clear the Lions will looking to upgrade at returner from Stefan Logan. It will also be interesting to see how they react if kickoffs are, indeed, eliminated. - One of the areas the Lions have improved greatly is running the ball in short yardage situations. A reason Stafford's touchdown passes are down is because the Lions' rushing TDs are up. The Lions' 16 rushing touchdowns this season is their most since Barry Sanders had his 2,000-yard season in 1997. This should be a very good offense. It's a shame it has lacked such consistency this season, and had a propensity for untimely mistakes, particularly penalties and dropped passes. The makings are there for a terrific offense. It was especially true before the Lions' receiving corps were depleted. 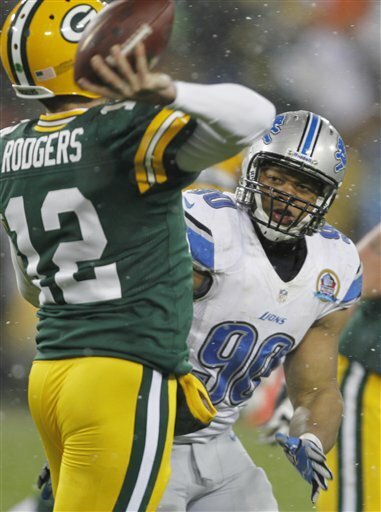 - In retrospect, the Lions most impressive victory of the season was when they rallied to beat Seattle. The Seahawks have made the Cardinals and Bills seem like Pop Warner teams the last two weeks. - The Lions offense looks flat, too say the least. Disappointing so far. 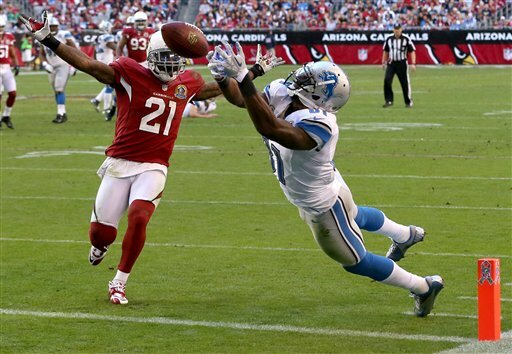 - Beyond trying to score points, the Lions should also be motivated not to punt today because it puts the ball in the hands of the Cardinals' biggest game-breaker, Patrick Peterson (yes, even beyond Larry Fitzgerald). The Lions contained Peterson well on the first three punts, but the odds will not be with them if they continue to punt to him throughout the game. - D'Andre Levy continues to have a very good season, making an interception in the first quarter. Linebacker is not a problem for the Lions. All three of their starting linebackers have played well this season. - Rookie Cardinals' QB Ryan Lindley got much hype as an NFL prospect before he played for San Diego State at Michigan early last year. Mel Kiper had him No. 1 among senior quarterbacks on his preseason list. But Lindley showed little that day vs. the Wolverines (Michigan State's Kirk Cousins, who is playing so well for the Redskins was No.2). Lindley has not been impressive with the Cardinals, either, although he has been pressed into service far earlier than could have been anticipated. Lindley ended up being just a 6th round selection after a somewhat disappointinging senior season. - Expanding the playoffs would water down the value of reaching the playoffs. Currently in the NFL, it can't really be that bad a season for those teams getting into the playoff field. Less than half the league gets in. If more teams are added, you'd see more .500 or sub .500 teams get in. - Right now, being a division champ means a lot, often a first-round bye. I think that's a good thing. - Players are already stretched to the max when it comes injuries. Adding two games to the regular season, which was quickly shot down by the players (correctly) in the last collective bargaining negotiations, would have been a disaster. The NFL, like virtually any successful business, has the idea that if you are not expanding your business, you are not growing. But player safety must be paramount in comparison to that ideal. It is only a couple more games, but the domino effect of more teams playing for higher stakes late in the season, in addition to the added playoff games, would put far more players at risk of injury. Matthew Stafford: Another Tom Brady or Tony Romo? Taylor Lewan a first-team All-American? Really? One of the more intriguing aspects of college football is the selection of offensive linemen for All-American teams. Is it based on who will be selected early in the NFL Draft? Is it based on the production of the given player's offense? 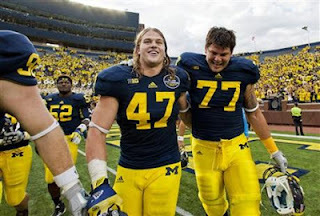 Lewan (right): How effective was he really? 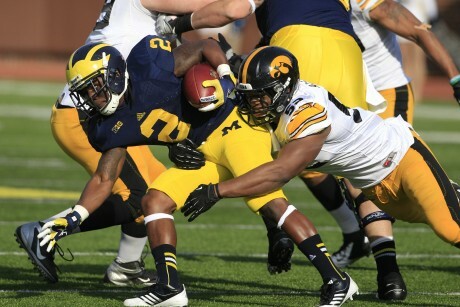 Based on NFL Draft potential, Michigan tackle Taylor Lewan deserved his spot on the first-team AP All-American team. He is projected to go in the Top 10 selections in the draft. As for production, how could he have been that effective if the Wolverines struggled so to run the ball this season? I mean that got virtually no production from their running backs, and what yardage Michigan gained, seemed based almost exclusively on QB Denard Robinson's open field speed and elusiveness. 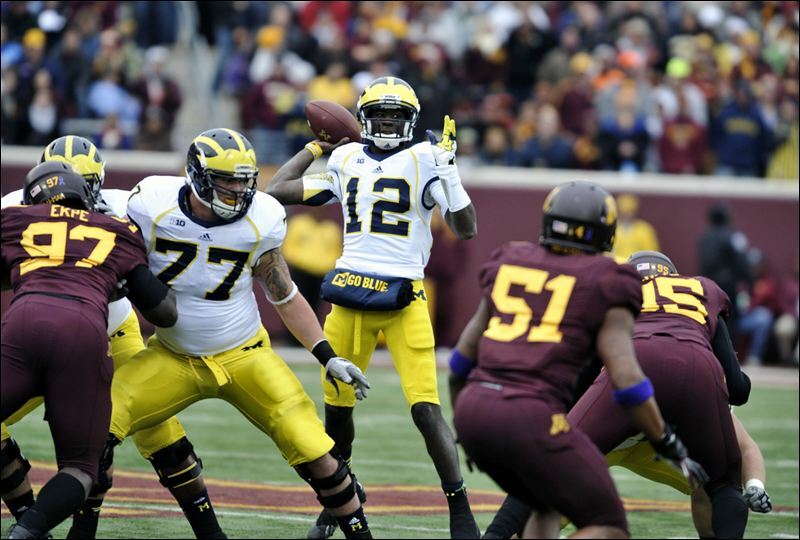 It wasn't like the Wolverines were running to glory hitched behind Lewan. Also, it should be noted that Eric Fisher from Central Michigan, also an offensive tackle, made third-team All American. 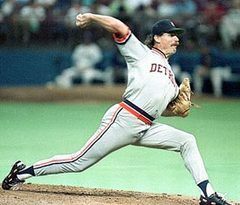 Fisher was a vastly underrated player and athlete (he was a very good basketball player, too) at Rochester Hills Stoney Creek High School, where he played for a relatively new program. He is also projected as a first-round NFL Draft pick, following in the footsteps of CMU's Joe Staley, who has starred for the 49ers. - In or near the scoring zone, in man-to-man coverage, the Lions are infamous for turning their back on pass plays and forgetting about all the territory between the line of scrimmage and the end zone. It led to the game-winning touchdown pass last week by Andrew Luck of the Colts to receiver Donnie Avery. It led Rodgers' touchdown run tonight. - All Joique Bell does is make plays. He made another one in the third quarter. No mistake there one-on-one against a linebacker. - Jason Hanson missed a huge field goal attempt on Thanksgiving Day, but otherwise, he is having a great season. It's a huge edge the Lions have in this game. Mason Crosby of the Packers is awful. - The Lions can't win this game if they turn the ball over. It's the way it is. It doesn't matter if they are up at halftime. It might prove to be a half in which they wasted the opportunity to get a bigger lead, and could be costly at the end of the game. Quarterback Matthew Stafford must do a better job of taking care of the ball. Period. There was excuse for the fumble the Packers turned into a touchdown. - The middle of the Packers defensive line is mediocre at best. Their offense line is injury-depleted and vulnerable. The Lions should not be overwhelmed in this game. They are certainly capable of winning it, but they continue to shoot themselves in the collective foot. It's been their problem inexplicably all season. - The excessive celebration for touchdowns in the NFL is a joke. Common on. What Tony Scheffler did for a celebration was mild. A fact a teammate joined in was spontaneous. In the meantime, the officials turn their backs to obvious calls that actually having a bearing on the game. - The more I see of Joique Bell, the more I'm convinced he is a solid every down NFL running back. - Packers' linebacker Frank Zombo undoubtedly will be reminded, upon his returns to the Eastside, how he was knocked off his feet on a block by Stafford. It will be in jest. 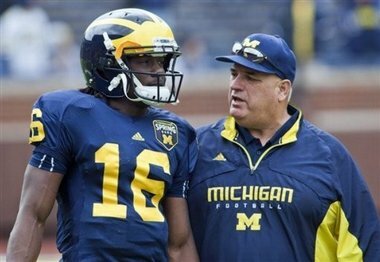 He has done Sterling Heights Stevenson High School and Central Michigan University proud. - Nerw Lions wide receiver Kris Durham didn't have impressive statistics when he played with Stafford at Georgia, and was a long shot to be even be drafted, but he was taken in the fourth round by Seattle in 2011 mostly because of a pro day in which surprised scouts by running a 4.4 40-yard dash and having a 36-inch vertical jump. He is 6-foo-6 tall, too, and the athleticism is there, which was apparent on his diving catch in the first quarter. He could be a bit of a sleeper, but only if he runs the right routes. He left his quarterback hanging out to dry on the interception. Sometimes posturing by the parties negotiating like we saw from NHL commissioner Gary Bettman and the players on Thursday isn't a bad thing. It can mean the real real issues toward an agreement are finally being addressed in earnest. Sometimes, though, it does mean what it seems - like there is no resolution in sight. Trying to read into it is a waste, kind of like this lockout itself, which is the most nonsensical I can recall given there is nothing really there to win for either side, only to lose. But when the players association hired Donald Fehr, this is what they asked for. It was like hiring Tony Montana to broker mob piece with Tony Soprano. Mostly, I wonder when there will be a drop dead date and the cancellation of the season will be imminent. If history is a gauge, that won't be for awhile. 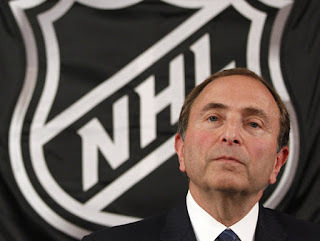 Bettman didn't cancel the 2004-2005 season until Feb. 16. In 1994-95, the NHL did play a 48-game schedule. The lockout ended Jan. 11 and the season started nine days later. The playoffs started the first weekend of May. The Stanley Cup playoffs ended June 24 when the Red Wings were swept by the New Jersey Devils in four games. In contrast, the Stanley Cup finals ended on June 11 last season, a six-game series between the Stanley Cup champion Los Angeles Kings and the Devils. My gut feeling is there will be a season, albeit it decidedly marred and skewed. Any team goals the Lions set at the start of this season have evaporated after four straight particularly disappointing and disheartening defeats. But the season is not over, just playoff aspirations. The Lions still have a quarter of their schedule remaining. The wrong approach would be just playing out the string. While the Lions aren't playing for a championship any more, they are playing for more than just pride. These four games will determine whether some players will stay or go, and in some instances, whether they remain in the league. So while Sunday's game at Green Bay is meaningless on the surface, it is an opportunity for the Lions to gain back a measure of respect they have justifiably lost. It's Sunday Night Football, which is generally the highest-rated show on all of television most weeks. It is against a top team. One of the biggest knocks on the Lions current regime is they "haven't beaten anybody." Also, what bigger ghost if there for the Lions to exorcise than Lambeau Field? They haven't won there since Herman Moore was a rookie and Matthew Stafford was learning how to walk. A win Sunday is not going to bring back a lost season. That ship has sailed. But the Lions need to move forward as quickly as possible. Getting an improbable victory at their longstanding house of horrors Sunday would be the perfect start. 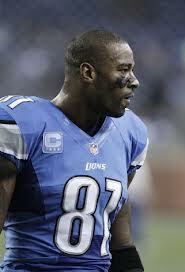 - The Colts have no answer for Calvin Johnson. It doesn't matter if they are double-teamming him. The Lions receiving corps have been depleted. Keep throwing him the ball. What a truly great player. He may very well break Jerry Rice's single-season yardage record. And the thing is, he is still capable of playing better and may be just scratching the surface. - Believe in halftime adjustments? So do I. The Colts evidently made some good ones, moving down the field with ease on a scoring drive to begin the third quarter. It says something good about their coaching staff, and not-so-good about the Lions staff. - The Colts have been in the scoring zone three times in this game, and gotten a touchdown each time. The Lions have threatened far more, but have settled for field goals three times. It could ultimately be the difference in the game. It's the only reason it is still relatively close. 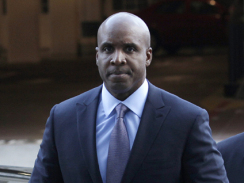 - The officiating in the NFL is stunningly inconsistent. There clearly should have been a personal foul penalty call on Stefan Logan's punt return late in the quarter. He was tackled five yards out of bounds. It was a textbook example of a late hit. Yet, no flag. - This is easily Ndamukong Suh's best game of the season. Any praise for him after this game won't be hollow, like it has been at times this season, when fans and some media seemed quick to excuse his lack of production. - The Colts' Andrew Luck and Lions' Matthew Stafford certainly have lived up to their advance billing in the battle of first overall draft pick QBs. They may not always be effective, but they sure are thrilling. It's not just the QBs, however, who have stood out in this game. There have been some tremendous catches. The one-handed grab by Calvin Johnson down the right side line (while holding off the defender with his off hand) was one for the ages. It was an exceptional play they will be replaying for years to come. - Anbody who questions Stafford's toughness only needs to see the play in the middle of the second quarter when he scrambled right, stopped and then gunned the ball deep down the field toward Johnson. He could he was going to be clocked by two oncoming Colt defenders rushing at him at full speed. Johnson almost caught that ball. Perhaps he should have, but it was nonetheless a terrific effort by the Lions' QB. - I don't know if Detroit tight end Brandon Pettigrew's specutacular touchdown reception in the first quarter was negated by his drop in the second quarter. I only know it wasn't good. It killed the momentum of a drive after cornerback Drayton Florence's interception. The Lions would have greatly benefitted from a TD rather than a FG in that situation. - The most underrated aspect about Luck is not only his mobility (he is far more athletic than given credit) but he is very strong on his feet. There are precious few QBs in the NFL who could escape from the grasp of both Ndamukong Suh and Nick Fairely on the same play like he did during the second quarter. And the value of buying extra time like that, while still keeping his eyes down the field, can't be overstated. - That was a horrible read by Stafford on Robert Mathias ' interception at the end of the half. He was duped into that pick by the Colts defensive call dropping Mathias' unexpectedly into coverage. It was a nice defensive stand after the turnover by the Lions. - Jason Hanson is now 2-for-2 on FG attempts of 50 yards or longer this season. Now, if he were only 1-for-1 from 47 yards. - Interceptions by Florence and Don Carey? Nobody could have seen that coming today? We'll see if the Lions take advantage of it. - Lions defensive tackle Ndamukong Suh broke through and sacked Colts QB Andrew Luck on Indianapolis' first play from scrimmage. See, it's possible. Sacks, tackles, tackles for loss...those are are the things that determine outstanding and dominating play, even for a defensive tackle. Not empty stat sheets in losses. True stars make plays. 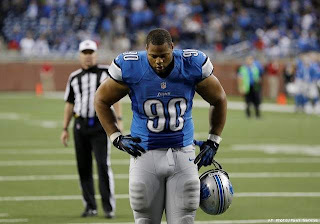 Hey, Suh made a play. - Tight end Tony Scheffler has certainly distinguished himself lately. It does make you wonder where that has been all year (although he did make a huge play in the win at Philadelphia). Also, that was a tremendous catch by his fellow tight end, Brandon Pettigrew. The Lions' tight ends should produce a lot. The middle of the field always seems to be open the way defenses are so conscious of deep patterns because of quarterback Lion QB Matthew Stafford's arm strength and Calvin Johnson being, well, Calvin Johnson. - Are the Lions a discernibly worse team without Titus Young right now than with him. No. If anything, they are better and it is addition by subtraction. I did talk to his father today while hosting Lions' Game Day on 97.1, the Ticket. He called in on his own accord, and was very sincere and dignified, which was appreciated. But there is really no excuse for the way his son has behaved lately. The one thing I very much agree with Young's father about is none of his issues have been criminal in nature, and should not be blown out of context in a certain sense. But Young has been hurting the team, not helping it. It's an unfortunate bottom line. - You can see already in this game that blitzing Luck is a recipe for disaster. He is not like most rookie QBs. He makes his reads quickly and gets the ball out of his hand quickly and on target. The Lions are going to have to rely on pressure from their front four, which is a strength, and drop more defenders in coverage to try to confuse Luck a little bit, otherwise he is sure to have a big day. - Why did Stefan Logan try to return a kickoff out of the end zone after fielding it 8 yards deep? Made no sense at all. Logan is one of the Lions' players who is clearly playing for his job next season during these final five games.